I'm sure this is a very simple question, but I'm not familiar with the different mechanical parts of a simple switch. Is this the correct order (from inside box to outside), switch -> nut -> lockwasher -> [panel] -> locking ring -> nut? If so, which direction does the locking ring face? In both cases, the first nut is adjusted so the bushing sticks through the panel far enough to get the second nut on. The second method depends on the lock washer to prevent rotation - but a toggle switch is not likely to rotate anyway. Not the answer you're looking for? 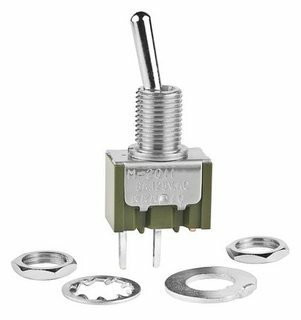 Browse other questions tagged switches mechanical-assembly or ask your own question. What are some cheap, reliable methods of water-proofing switches and buttons? Why is my LED less bright when activated through a vibration switch? How can I avoid this? How to turn on a device with only 1 wire between itself and switch?